Other countries that claim large chunks of the South China Sea – Vietnam, the Philippines, Taiwan, Malaysia – all control real islands. 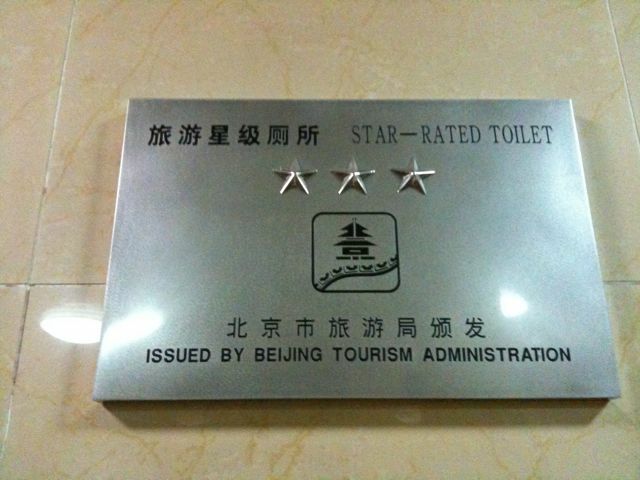 But China came very late to this party and missed out on all the good real estate. Beijing only took control of Johnson South Reef in 1988 after a bloody battle with Vietnam that left 70 Vietnamese sailors dead. Hanoi has never forgiven Beijing. Since then China has shied away from direct military confrontation. But now Beijing has decided it is time to move, to assert its claim and to back it up by creating new facts on the ground – a string of island bases and an unsinkable aircraft carrier, right in the middle of the South China Sea. The Ninth Design and Research Institute of the state-owned contractor bared three-dimensional design plans for reclamation project on disputed waters showing an artificial island consisting of military airport, a long airstrip and a boat harbor for law enforcement. About 30 hectares or 74 acres of the reef are proposed to be reclaimed, purportedly for the China People’s Liberation Army to strengthen its posture in the contested maritime area, claimed by the Philippines, Vietnam and Malaysia. – The giant bag of mandarin oranges I was given for my 10 yuan bill (about $1.40). – Realizing that google maps business locations on maps are really more of a it-might-be-on-this-block suggestion. The actual location might be half a block down and on the opposite side of the street. 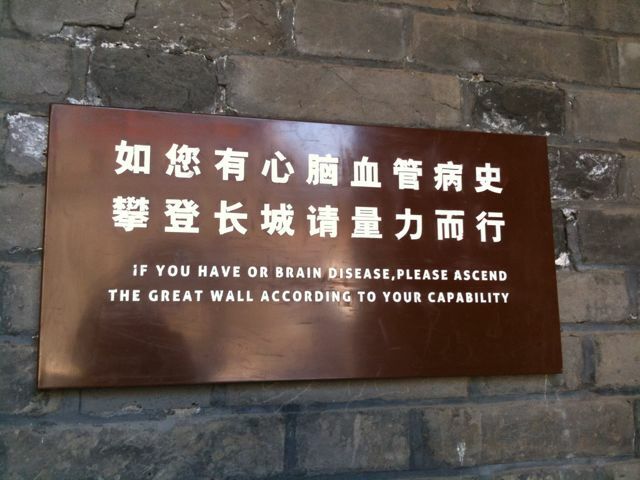 Weather, roads, and miscommunication seemed to conspire against us visiting any section of the great walls. 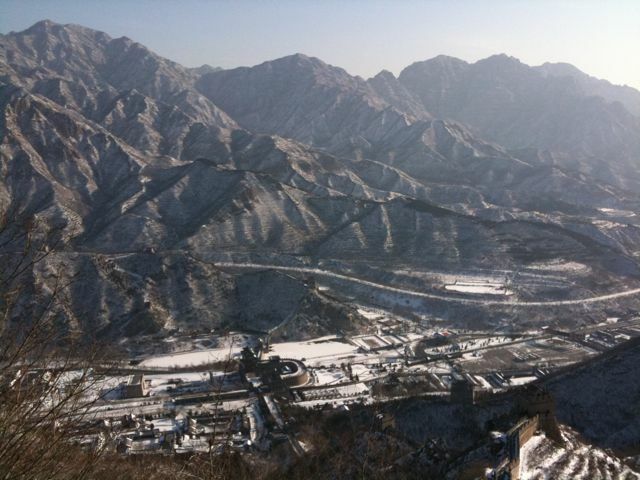 The morning before our flight to Korea we finally managed to visit Juyong pass. 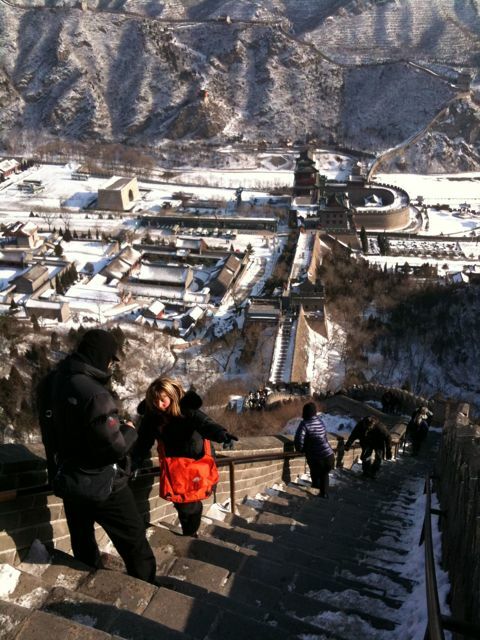 The wall at Juyong pass is impressive not for its size, but because of the very steep ground it covers. 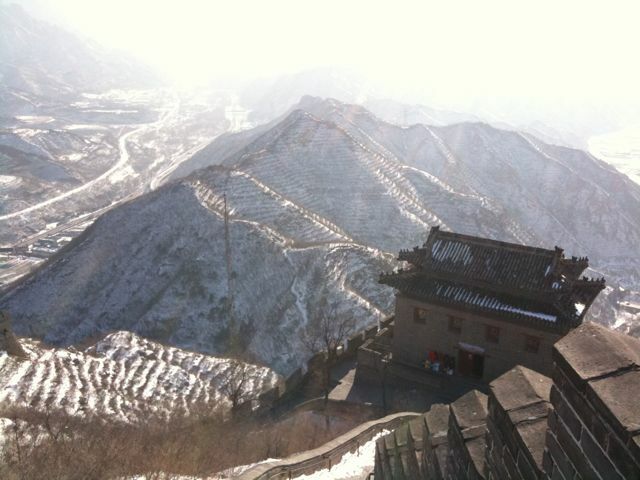 It is easy to see why the area was picked to fortify, it blocks the only route through the mountains. 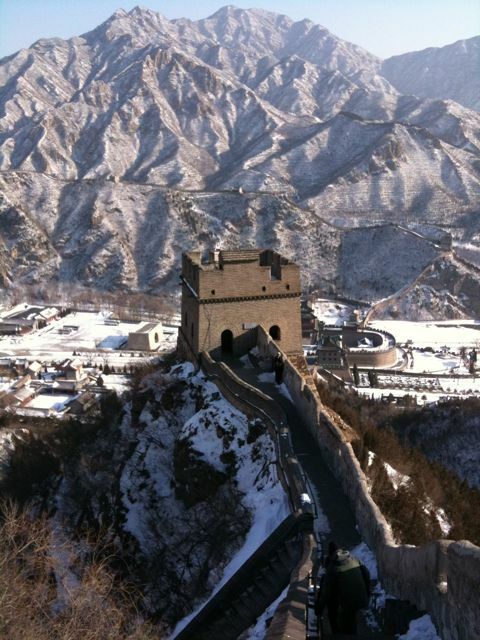 We climbed the steep side of the wall and were rewarded with great views of the surrounding mountains. The ice made the climb a bit sketchy on the way down, but overall it was fairly clear from the record snowfalls. Most of the hills kept their white blanket though, and it added to the view. All the roads to different great walls were closed again today. It is clear they aren’t equipped to handle this level of snow and cold – every bit of snow we have seen removed has been completely by hand. I’m hoping they are finally open tomorrow – we can try for a quick visit before heading to the airport. 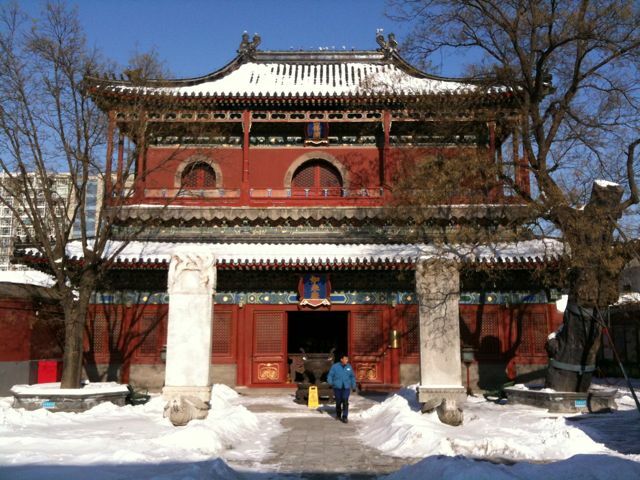 This morning we visited the Zhihua Temple (Zhihuasi) in the Lumicang hutong near our hotel. Several winding unmarked hutong streets deep, the temple was a bit tricky to find. We arrived just in time to catch the end of the music performance by yellow costumed temple staff. 15 minute performances of Jingyue are given by a group of Buddhist musicians each day at 9, 10, 11 and 3. It has apparently been happening here for a while, they are the 28th generation of musicians to play on the grounds. The rest of the temple complex is not large, but has some very nice carvings and the main building has 9999 nooks and a small statue of Buddha in each. Some of the buildings have been repainted, but in general the temple seems to have been left alone and minimally promoted for western tourists. Not a bad thing for us – we were the only ones there – but one wonders what the government plans for the site are. It was clear, sunny, and brutal with the wind chill. The snow yesterday meant blocked roads today, and no trip to the wall. 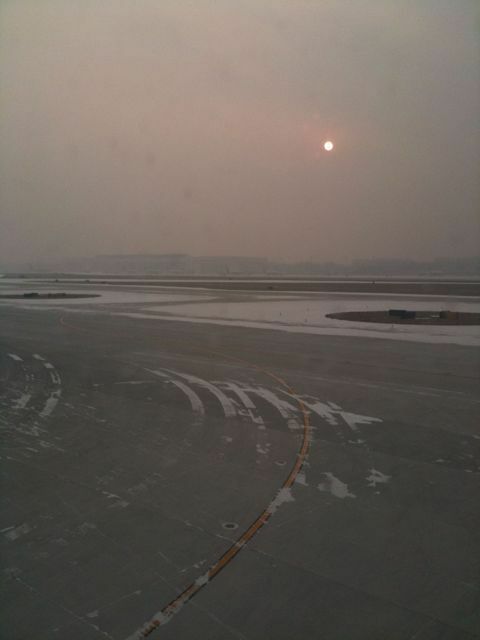 The snowfall yesterday was the most Beijing had seen in 60 years. 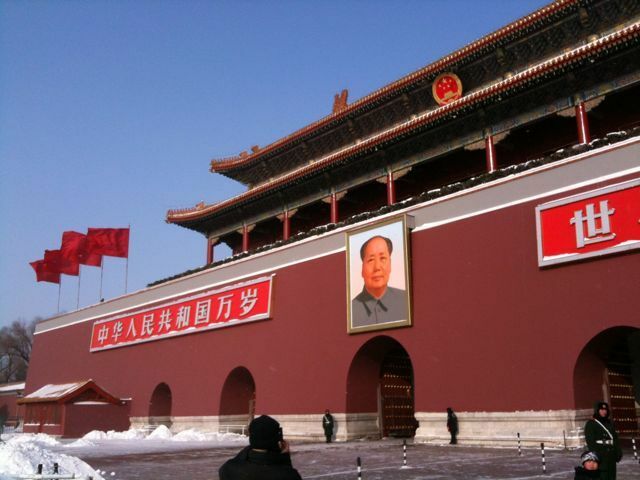 After a breakfast of champions – buozi (steamed buns with pork) – we headed over to the square and forbidden city. The square was almost empty – the howling wind made sure of that. 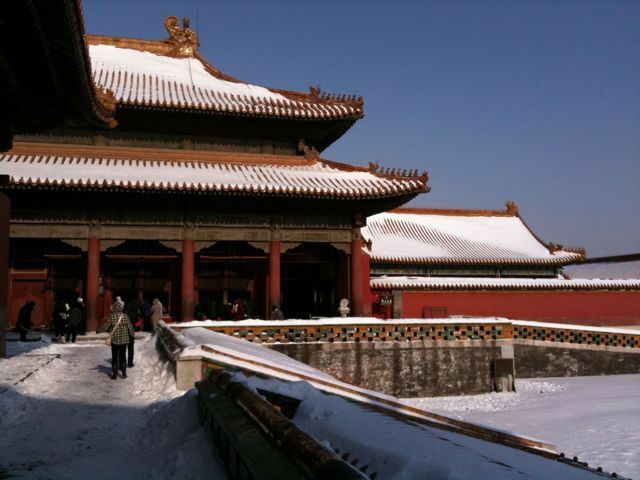 The forbidden city was also cold, but the high walls and buildings gave us some breaks from the wind. The same walls also funneled and concentrated the wind through hallways and doors leading into other areas – keeping on your feet and moving forward were a challenge at times. It was worth the chill, the area was gorgeous in the snow and sun. The views from Jing Shan and Jade Island were great, it was clear today and much of the city could be seen. After a tea house visit – I’m drinking copious amounts of the lovely stuff – we walked the lakes. Bei Hai, Qian Hai, and Hou Hai. It was great to see skaters and pilots of strange ice machines (chair-sleds with ice picks, bicycle sleds) enjoying the frozen lakes. I had thought I might join them, but when we got there I had no interest in taking off my shoes to swap into skates. The wind chill made me think I would end up missing some toes. 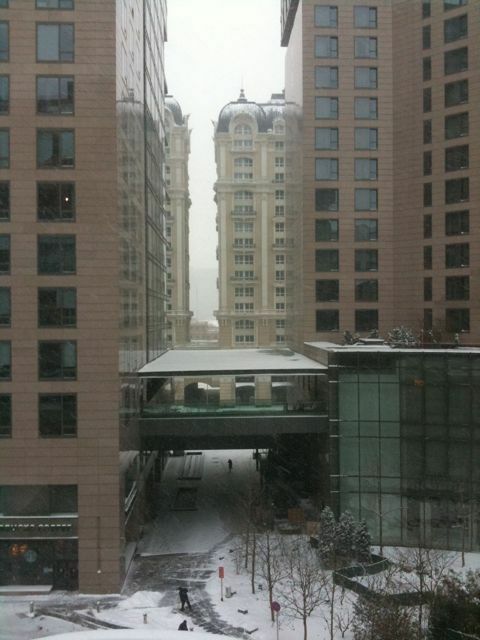 It was a snowy day in Beijing. The markets and streets were still busy. We hit up the antiques area and ran unto some tough bargainers. 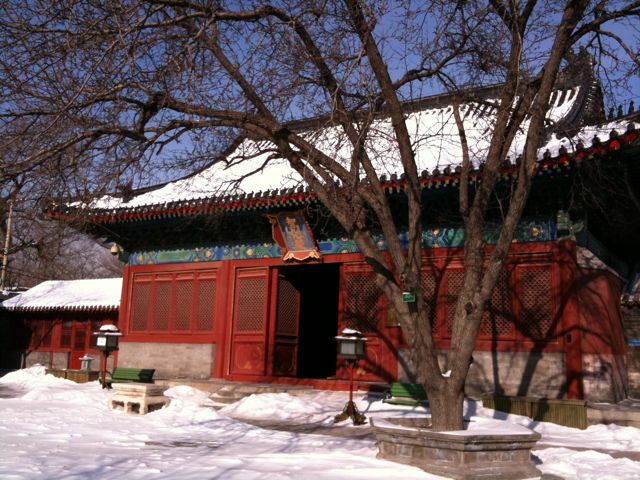 Then it was on to the Temple of Heaven for a walk around. The park is beautiful in the snow and the marble steps deadly. As we were exiting the park it got dark enough for the lights to turn on. There are few things more lovely than thick fluffy snow flakes falling on a lamp lit tree lined path. To add to the moment, three separate groups (two older ladies, a guard, and an old guy on a walk) burst into songs. Perhaps singing keeps you warm. 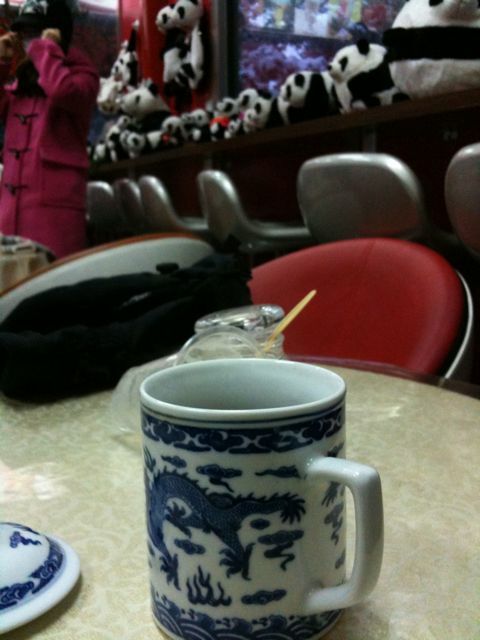 We fought off the urge to sleep and continued our very long day exploring our new hood and eating ducks in Beijing. Lots of bling. 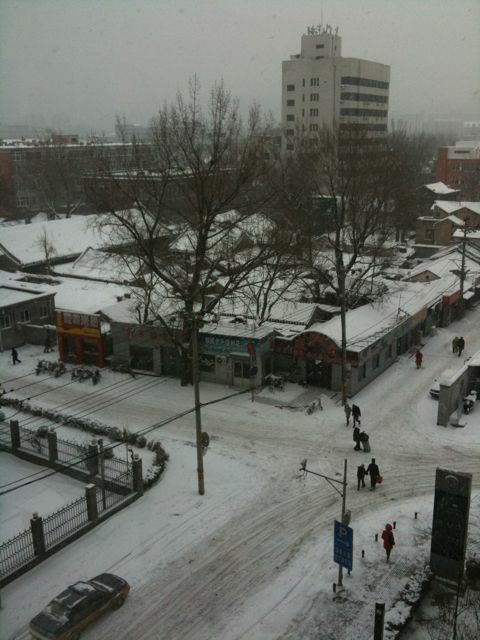 Today we are braving the snow to wander around town. It is nice to see the fresh snow, the stuff when we arrived was looking quite grimy.